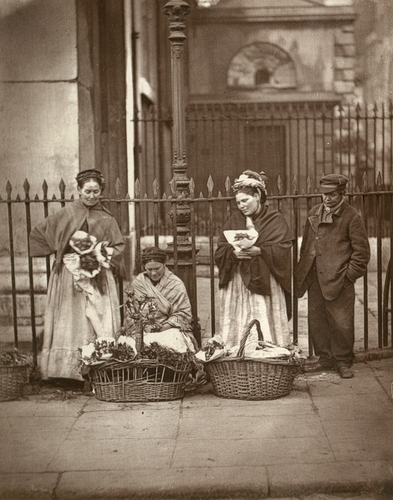 "How different is the Covent Garden of to-day, with its bustle and din, its wealth and pauperism, its artifices, its hot-house flowers and forced fruit, its camellias with wire stems, its exotics from far-off climes, to "the fair-spreading pastures," measuring, according to the old chronicle, some seven acres in extent, where the Abbots of Westminster buried those who died in their convent. In those days vegetables were not only sold here but grew on the spot; and the land, now so valuable, was considered to be worth an annual income of £6 6s. 8d., when given by the Crown to John Russell, Earl of Bedford, in 1552. [...] "When death takes one of the group away, a child has generally been reared to follow in her parents' footsteps; and the "beat" in front of the church is not merely the property of its present owners, it has been inherited from previous generations of flower-women. Now and then a stranger makes her appearance, probably during the most profitable season, but as a rule the same women may be seen standing on the spot from year's end to year's end, and the personages of the photograph are well known to nearly all who are connected with the market."